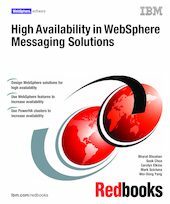 This IBM® Redbooks® publication is for anyone needing to increase WebSphere® messaging availability, especially people interested in the new capabilities of WebSphere MQ and WebSphere Message Broker. It discusses and demonstrates solutions to provide high availability for WebSphere Messaging solutions. For the distributed platforms, this ranges from the traditional PowerHA™ for AIX® to the new WebSphere MQ multi-instance queue managers and WebSphere Message Broker multi-instance brokers. For the appliance users, we included solutions for WebSphere DataPower®. For enterprises that need continuous availability of WebSphere MQ messages, MQ Queue Sharing Groups and the CICS® Group Attach features are demonstrated. The book includes guidance on HA options, such as when you might need PowerHA (or a similar solution for your platform), when the multi-instance features work for your applications, and when duplexing the coupling facility structures might be appropriate.